After resisting for months, Prime Minister Shinzo Abe finally agreed to bilateral talks with Donald Trump. He had little choice given how vulnerable Toyota and other carmakers are to U.S. tariffs. Sticking with TPP, however, has given Japan leverage in areas such as agriculture. 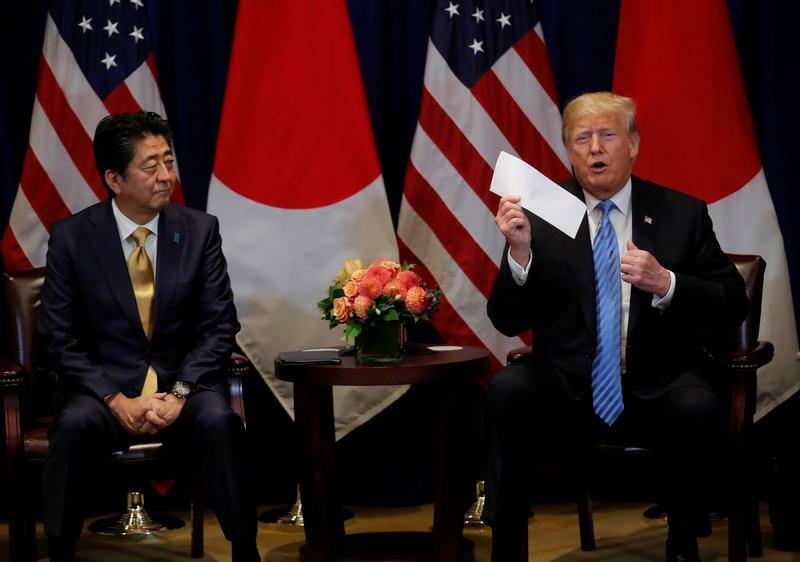 U.S. President Donald Trump shows a letter Trump said he received from North Korea's leader Kim Jong Un during a bilateral meeting with Japan's Prime Minister Shinzo Abe on the sidelines of the 73rd session of the United Nations General Assembly in New York, U.S., September 26, 2018. U.S. President Donald Trump and Japanese Prime Minister Shinzo Abe said on Sept. 26 they had agreed to start talks on a bilateral free trade agreement. In a joint statement, the two countries said they would negotiate on trade in goods and services, aiming to produce "early achievements." "For Japan, with regard to agricultural, forestry, and fishery products, outcomes related to market access as reflected in Japan's previous economic partnership agreements constitute the maximum level," it added. This refers to the Trans-Pacific Partnership, a multilateral agreement which Trump abandoned but Japan ultimately ratified.